This story is about a luxury yacht with expected amenities — such as gorgeous sun decks and elegant eating areas — but also a high-tech twist or two. 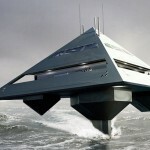 Created by London-based architect Jonathan Schwinge, the Tetrahedron Super Yacht’s unique design is based on a three-based pyramid shape. But beyond the vessel’s four faces and six leading edges (which provide greater stability), it actually appears to float above the water — thanks to a single vertical strut on a torpedo hull that remains underwater. 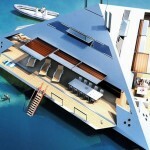 According to Schwinge, the yacht will lift above the water (at speed) on side-mounted, adjustable hydrofoils. This enables the vessel to travel smoothly — even in choppy waters — and reduces seasickness by eliminating any rocking or heeling. The yacht features a take-off speed of 15 knots (17.2 MPH), and can reach speeds as high as 38 knots (43.7 MPH) above the water line. Its range is 3,000 nautical miles. While there is no price tag on the Tetrahedron Super Yacht, it’s easy to see that this kind of vessel would be coveted by high-tech fans who can afford such a luxury item.